But where does our fascination with Fast Sketch come from? It can be compared with a portrait painter at a holiday beach resort: People stop and stare to watch what is being painted next and how the artist will interpret real people and events. 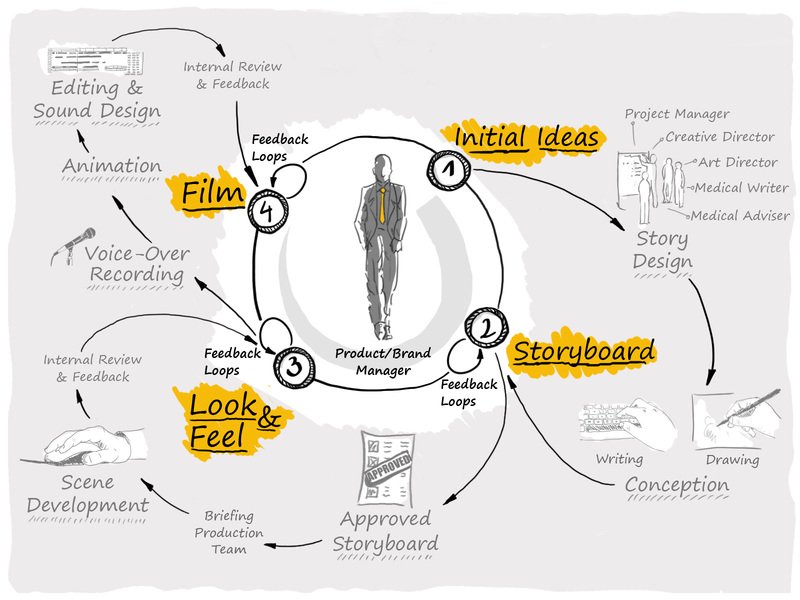 The step-by-step creative process makes it easy to present a topic, explain it, and build a story around it. This also makes Fast Sketch very appealing for animal health marketing. This article is an introduction to this technique. Today’s article will show you different styles and methods, describe advantages and disadvantages, and give you an overview of the typical workflow of a given project in animal health. A Fast Sketch project usually begins by sketching several ideas on a white piece of paper, leading to a story that is animated using various techniques. In this way, films conveying processes, procedures and concepts can be quickly created. It is often desirable, however, to convey a specific message to a designated target audience. After a detailed briefing, we know what messages our customer would like to communicate, which target audience needs to be addressed using which channel, the objectives that the video should achieve and what the available budget is for the production process. Next we discuss some key ideas that have been identified during the early project phase regarding future possible use within budget parameters. As dictated by the project, apart from the conceptualization team, there are also medical advisers who will ensure medical and professional accuracy. The most important first step is the creation of a detailed storyboard. This will give the customer a precise picture of how the story will proceed, how each scene will look, and what text will be spoken with it. The storyboard is then discussed with the customer, optimized, and finally circulated internally within the company. After approval, we move on to implementation. One of the big advantages of Fast Sketch projects is that the images in the storyboard can immediately be developed for animation. Unlike 3D animation projects, there is usually no need for another round of approvals regarding the look and feel. The different scenes on the storyboard are then treated by the creative team following a step-by-step approach, adding music and a professional speaker as needed. The first version of the complete film is given to the customer and released for use. This option allows the viewer to watch the image’s development during the drawing process by filming the artist’s hand, which also expedites the postproduction process. This technique is especially suited to linear processes and requires great concentration and skill from the drawer. Thus, a great deal of work is needed to achieve an end product that appears effortless and simple when producing such a film, especially regarding its conception; however, the expense is still somewhat less than that of complete 3D animation. Moreover, Fast Sketch is especially well-suited in areas not ideal for 3D animation, such as communicating information not underpinned by a concrete process. For example, in the phrase “The condition is characterized by exhaustion and fatigue,” which images jump to mind – those created by 3D animation or Fast Sketch?